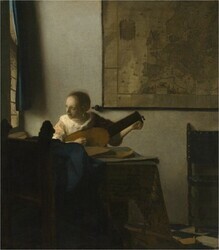 C. Richard Johnson Jr., Sleuthing Vermeer’s Canvas , National Gallery of Art, https://purl.org/nga/documents/literature/essays/sleuthing-vermeers-canvas (accessed Apr 24, 2019). Export from an essay page includes title, essay sections, images, comparable figures and notes. Think like a detective. Establishing a timeline of events and providing evidence of a modus operandi associated with a particular criminal are key elements in police procedurals. These two types of tasks are also important activities in art historical scholarship. The chronology of the artworks produced by an artist is vital to the proper interpretation of an artist’s progress and impact. An understanding of an artist’s studio practice, including the preparation and use of particular materials, aids in the attribution of inadequately documented artworks. In the study of old master paintings, one element to consider with regards to the artist’s materials is the canvas used as the painting’s support. During the 17th century in the Netherlands, canvas supplanted wood panels as the preferred material on which to paint. To prepare it for painting, the canvas was first coated with animal glue that reduced its absorbency. Then it was covered with a ground layer of paint to provide a smooth surface on which to construct the painting. In the 17th century, shops in the Netherlands would buy rolls of canvas from weavers and sell them to artists in different formats. An artist could buy full or partial rolls of raw canvas that could be cut for individual paintings. The artist or artist’s assistants would mount these individual pieces on a strainer to keep their surfaces taut and then apply glue sizing and the ground layer. Shops also offered canvases in various dimensions already prepared with sizing and ground. In either case, the artist could use canvases that originally came from the same roll for multiple paintings. Art investigators have generally presumed that two paintings in a similar style on canvas from the same roll were painted by the same artist—or by assistants in the artist’s studio. Since historical documentation supports the claim that Johannes Vermeer did not have pupils, two paintings in Vermeer’s individual style on canvas from the same roll can be considered to have been painted by Vermeer himself. The question, then, is, what forensic evidence demonstrates that two separate pieces of canvas came from the same roll? The vast majority of old master paintings have been relined to help mitigate the deterioration at the edges attached to the strainer. A new piece of canvas is glued to the back of the old canvas with the edges of the new canvas wrapped around and attached to the strainer. With paint covering the front of the painting, the original canvas is hidden. Because the ground layer typically includes paints such as lead white that attenuate x-rays, x-radiographs of paintings can be used to reveal the impressions of the threads in the ground layer. These impressions can be counted with suitable magnification of the x-radiographic image. The ground layer sitting atop each thread will be thinner than the amount that penetrates between the threads. This results in a variation in intensity of the x-ray that penetrates the canvas and is exposed on the film. The other issue is that average thread counts can be the same for different rolls of canvas. An explanation of this process and the software to implement it is provided in W. A. Sethares, “Automated Creation of Weave Maps,” in Counting Vermeer: Using Weave Maps to Study Vermeer’s Canvases, ed. C. R. Johnson Jr. (The Hague, 2017). 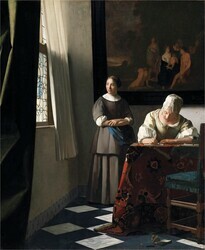 This monograph is availble at countingvermeer.rkdmonographs.nl/ in conjunction with the exhibition Vermeer and the Masters of Genre Painting: Inspiration and Rivalry held at the National Gallery of Art from October 22, 2017, to January 21, 2018. 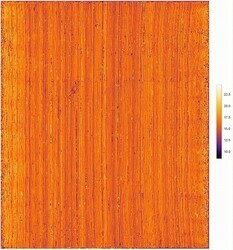 The vertical stripes in the weave map [fig. 3] [fig. 3] Vertical thread density map with color bar relating displayed color to thread count are due to the mechanics of the weaving process. This pattern would continue for the same threads as they traverse through the entire roll. 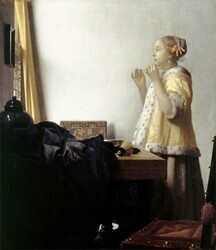 Imagine that the piece of canvas on which Vermeer made The Art of Painting had been cut in half prior to its use; a similar pattern would be evident in the rest of the canvas. 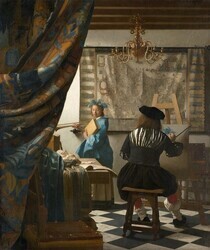 Should Vermeer have used that portion of the canvas for another painting, one would find that the weave map would align. One could then determine that the two paintings were roll mates. Thus, weave maps provide definitive forensic evidence that can be used to identify roll mates. The connected pairs are A Woman with a Lute and Woman Writing a Letter, with Her Maid (figs. 4 and 5), and Woman with a Pearl Necklace and Woman Holding a Balance (figs. 6 and 7). For further discussion of roll mates among Vermeer’s paintings, see C. R. Johnson Jr., “Exploiting Weave Maps,” in Counting Vermeer: Using Weave Maps to Study Vermeer’s Canvases, ed. C. R. Johnson Jr. (The Hague, 2017). This monograph is available at countingvermeer.rkdmonographs.nl/ in conjunction with the exhibition Vermeer and the Masters of Genre Painting: Inspiration and Rivalry held at the National Gallery of Art from October 22, 2017, to January 21, 2018. This new forensic evidence provided by weave maps may well provide new information for assessing Vermeer’s working process and the dating of his works. The vast majority of old master paintings have been relined to help mitigate the deterioration at the edges attached to the strainer. A new piece of canvas is glued to the back of the old canvas with the edges of the new canvas wrapped around and attached to the strainer. With paint covering the front of the painting, the original canvas is hidden. Because the ground layer typically includes paints such as lead white that attenuate x-rays, x-radiographs of paintings can be used to reveal the impressions of the threads in the ground layer. These impressions can be counted with suitable magnification of the x-radiographic image. The ground layer sitting atop each thread will be thinner than the amount that penetrates between the threads. This results in a variation in intensity of the x-ray that penetrates the canvas and is exposed on the film. For a timeline and other information regarding TCAP, see C. Richard Johnson Jr., “Thread Count Automation Project (TCAP) Timeline (2007–2014),” http://people.ece.cornell.edu/johnson/tcap.html. Walter Liedtke, Vermeer: The Complete Paintings (Ghent, 2008). The connected pairs are A Woman with a Lute and Woman Writing a Letter, with Her Maid (figs. 4 and 5), and Woman with a Pearl Necklace and Woman Holding a Balance (figs. 6 and 7). For further discussion of roll mates among Vermeer’s paintings, see C. R. Johnson Jr., “Exploiting Weave Maps,” in Counting Vermeer: Using Weave Maps to Study Vermeer’s Canvases, ed. C. R. Johnson Jr. (The Hague, 2017). This monograph is available at countingvermeer.rkdmonographs.nl/ in conjunction with the exhibition Vermeer and the Masters of Genre Painting: Inspiration and Rivalry held at the National Gallery of Art from October 22, 2017, to January 21, 2018.